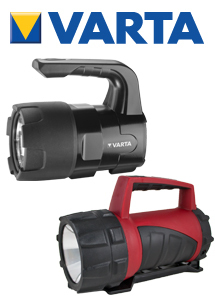 The Indestructible 3 Watt LED Lantern from Varta covers up to 350m range and lasts for 78-hours with 150 Lumens this lantern is shock resistant up to 4m. The Industrial Beam LED Lantern is waterproof up to 1m and is resistant to chemical fluids such as Oil, Petrol and Diesel. Producing light up to 265m and running for 75 hours this lantern also puts out 135 lumens.